Make the First Five Count is Easter Seals FREE child development screening tool to help measure and keep track of your child’s growth and development. Are you curious about how your child is doing? Do you have concerns about your child’s development? Then take one or both of our free screenings. To look at key developmental areas: communication, gross motor, fine motor, problem solving and personal social skills. You will be asked to answer questions about things your child can and cannot do. para mirar áreas clave del desarrollo: comunicación, habilidades de motor grueso y motor fino, resolución de problemas y habilidades sociales personales. Se le pedirá que responda preguntas sobre cosas que su hijo/a puede y no puede hacer. For a more in depth look at a child’s social and emotional skills. This survey includes questions about your child’s ability to calm down, take direction, follow rules, follow daily routine, demonstrate feelings and interact with others. Based on your responses, the results will help you see if your child’s progress is on track and alert you to any potential concerns. By detecting developmental delays early, you have the power to change lives and educational outcomes for children! If delays are identified, Easter Seals DuPage & Fox Valley can offer the support needed to be school-ready and build a foundation for a lifetime of learning. Research proves that when children receive the right treatment and therapy they need before age five, they are more prepared to learn alongside their peers, build lifelong skills and achieve their dreams. We encourage you to rescreen your child in order to monitor and celebrate their development. 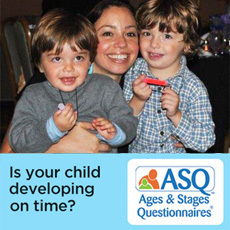 The ASQ-3 (developmental screening tool) may be taken every 2-, 4- or 6- month period.